It’s no secret by now that I’m a bit of a political junkie, and so far the 2016 presidential campaign has me pretty depressed. Oh, I have my preferences – which you won’t hear about here, given that Greenlining is nonpartisan and can’t support or oppose candidates – but I can’t help feeling a bit overwhelmed by what’s not being discussed. To illustrate, let’s take a couple issues Greenlining works on, starting with banking, finance and wealth. On financial regulation, we have a clear partisan divide. Republicans generally want to repeal the Dodd-Frank financial reform law. Democrats Hillary Clinton and Bernie Sanders both want to expand it in different ways, increasing regulation of perceived Wall Street excesses. That’s fine as far as it goes: Voters can see a clear difference between the parties, and different approaches within each party. But no one is talking about the racial wealth gap, even as they aggressively pitch their candidacies to voters of color. As you may have heard us say before, for every dollar a white family has, the median Latino family has around seven cents and the median African American family has just over a nickel. Sanders has been most vocal about wealth and income inequality between the wealthy and the rest of us, but his web page on these issues doesn’t even mention the racial wealth gap. Neither does Hillary Clinton’s website, as far as I can tell. Both Democrats talk about education, labor rights, small business and the minimum wage, but neither drills down into how specifically they would make ladders of opportunity like homeownership and entrepreneurship more available to communities of color. Homeownership, for example, represents a major path to wealth creation in our society, and – as a report our Economic Equity team is getting ready to release will show – it remains largely closed to families of color. Republicans aren’t doing any better. GOP front runner Donald Trump says he’ll “be the greatest jobs president ever,” but doesn’t give details. Pretty much all the Republicans say they can boost the economy by rolling back regulations and simplifying and/or cutting taxes, but none seems to have thought about how to ensure those promised gains reach the communities being left behind in today’s economy. There’s a similar void in discussions of climate change. Democrats want to do something about it while Republicans, who generally want to double down on fossil fuels, either deny it’s happening or get vague when pressed on the question. Again we have a clear partisan divide, but so much is missing from the conversation. California has pioneered visionary policies that both put a price on carbon and then channel a big hunk of those proceeds to clean energy and energy efficiency projects in underserved communities. Tying clean energy to a serious effort to bring both good jobs and cleaner air to communities that have had far too little of either strikes us as a really good idea – indeed, it’s already changed lives for the better. But Clinton and Sanders don’t seem to be aware that it’s possible. Clinton, to her credit, has a plan to help communities being hurt economically by the decline of the coal industry, but neither Democrat has put forth any sort of vision for how their climate policies can uplift low-income communities from Flint to Fresno. I wish the parties would engage on this. Being old enough to remember when conservatives wanted to, you know, conserve (it was Richard Nixon who signed the Environmental Protection Agency into existence and put a straight-up guy, William Ruckelshaus, in charge), I’d like to hear their ideas. Transitioning from fossil fuels to renewable energy will, beyond question, create both opportunities and economic dislocations. How do we minimize the harms and maximize the benefits? Is it too much to ask for some thoughtful, fact-based discussion? Too often, the concerns of people of color get reduced to a few sound bites about criminal justice and immigration, with maybe an occasional nod to the existence of racism. Important as those issues are, that’s not nearly good enough. 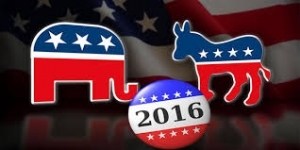 The presidential candidates of both major parties need to show broader vision and greater insight.